It's been a long, tiring but ultimately enjoyable day. 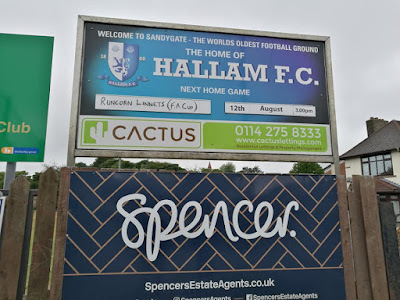 Regular readers might remember that I was intending to make a trip to Yorkshire on Sunday to pay a visit to the oldest football ground in the world. Well I succeeded and had a great time. If you don't know, the ground in question is called Sandygate. 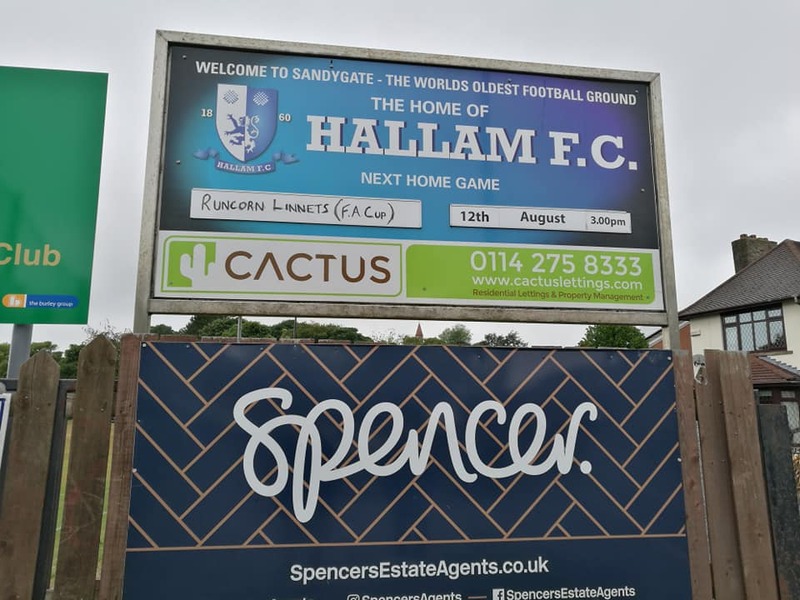 It's located in Sheffield and plays host to Hallam FC who have been at the ground since 1860. It's unusual as the football club share the playing area with the local cricket club so the ground only has three sides. Despite playing way down in the tenth tier, two of the three sides are well developed with a large modern stand, a decent covered terrace and fine new clubhouse. The match I saw was an FA Cup Extra Preliminary Round tie against Cheshire club Runcorn Linnets from two levels above. A decent crowd of well over 300 watched a competitive game but the visitors were the better side and deservedly won 2-0. Given its historic status, every football fan should at least consider a visit here. With rolling hills in the background and a considerable slope to the pitch, it's very different to the stadiums, grounds and arenas most fans are used to. It's also only £5 to get in and the food and drink are reasonable too. Give it a go! All that travelling means I haven't been able to devote as much time to the blog this week so the daily digest below is a little less in depth than usual so apologies for that. Finally, thanks to all those of you who have been in touch this week with info and photos of where you've been and those of you with questions about where to go. I love hearing from you all so do let me know what you've been up to and have a great week. There are over 90 matches in and around the London area over the next seven days with the Premier League and Championship dominating proceedings - there are also a number of replays in the FA Cup Extra Preliminary Round too.